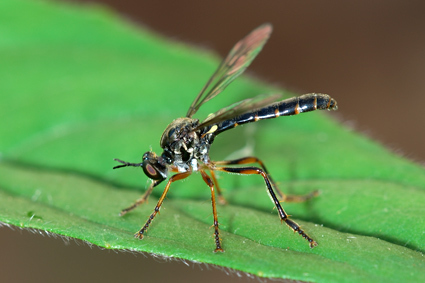 Dioctria hyalipennis , image © Michael Thomas. The Dioctriinae, originally described by Enderlein (1936), was not applied as a higher-level taxon until re-erected by Lehr (2001). It is shown to be a distinct taxon from other Dasypogoninae and Stenopogoninae sensu previous authors in which Dioctriini has been placed (e.g., Hull 1962, Adisoemarto & Wood 1975, Artigas & Papavero 1991). The Australian genus Broticosia is found to be the sister taxon to the remaining Dioctriinae. The genus Myelaphus is nested deeply within Dioctriinae as has been suggested before by Hull (1962) and Adisoemarto & Wood (1975). Artigas & Papavero (1991) placed it in Stenopogoninae: Ceraturgini along with Ceraturgus, which is considered to be a Brachyrhopalinae.